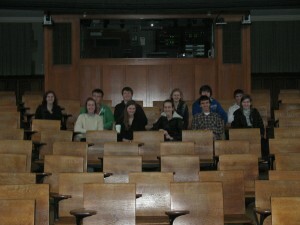 The Academic Team tried its hand at History Bowl on February 23rd. The New Jersey State Championships were held in the ivy-covered McCosh Hall on the campus of Princeton University. Phoenixville fielded three teams, with the A-team—featuring Captain Savannah Mudd, Kyle Kobilka, India Reiss, and Stephen Rakoczy—placing 15th in a field of 38 varsity teams. The top-20 finish earned the team a spot at the History Bowl National Championships to be held in Washington, D. C. Phoenixville’s B & C Teams were anchored by Aubrey and Claire Halloran, respectively, and featured Joe Gido, Olivia Teter, Emily Hrynko, Braden Bowdish, and Nick Mara.